Do you live in Esparreguera? 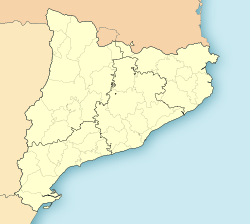 Esparreguera is a municipality inCatalonia, in the province of Barcelona, Spain. It is situated in the comarca of el Baix Llobregat. Esparreguera is famous in Catalonia for staging a grand version of the play Life and Passion of Jesus Christ every year in March and April, on the Sundays before and after Easter. The play is popularly known as La passió. Over 300 actors, 50 technicians and 100 musicians participate in the play during five acts, twenty scenographic settings and more than five hours of drama, from the election of the apostles until the resurrection of Jesus. Bell tower of the Santa Eulàlia church.